"We don't use fires or lanterns unless we have to. Fires draw the ones that hunt us, and fuel is too precious to waste. But our eyes are sharp, even at night." "My mom told me the first survivors tried to use guns against them, but their bodies kept moving no matter how many times they'd been shot. Like there was nothing inside them a bullet could kill. That's when they discovered you had to burn them." "People don't change, Querry. We're the descendants of the madmen who destroyed the planet. Why should we be any different?" "I still had no idea who I was. And now it turned out I had no idea who anyone else was, either." "The accident had cut me off from my past as completely as a knife slicing through rope. I could unspool days in my mind, think I was getting closer to the starting point, but then the rope would fall slack. And no matter how much I pulled, all I'd end up with in my hand was the frayed end. "Give it time," he had said. I clung to that. 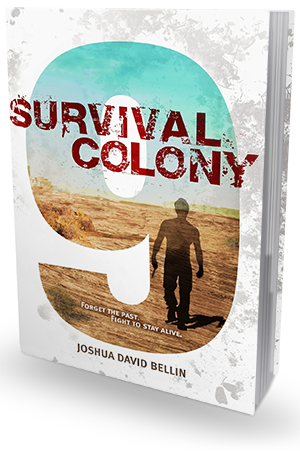 Survival Colony 9 is a solid post-apocalyptic thriller set in a world driven to the brink of extinction by its very own inhabitants - humans. This is the story of possibly (we don't know that for sure) the very last group of survivors - Colony 9. The story focuses primarily on one of the human survivors - a fourteen-year-old boy named Querry, as he is trying to get back all the memories he lost in a Skaldi attack 6 months ago. Querry doesn't know who he is or what happened to the world around him, all he knows is what he's been told by his father - the leader of Colony 9 - and other survivors. He's going to have to find out who his real enemies are, who his friends are, and who is telling lies. And, if he wants to survive, he is going to have to do this fast. Survival Colony 9 is very vague on details. We don't know what happened to the world exactly - there are hints and rumors scattered throughout the plot, but nothing that would give us a good idea of what happened to the civilized world and all the people. All we know is that humans are responsible for all the destruction. Oddly enough, the lack of specifics works well here, adding to the creepy, disquieting atmosphere and the bleakness of the parched, lifeless land. I really enjoyed the setting - the author did a great job describing the dessert-like world in all its hopelessness and deadly, cruel glory. Skaldi are a terrifying new breed of creatures, something I haven't yet seen in fiction. They take over human bodies. They "use (the bodies) up" in days, weeks at most, and then they move on to the next "host". "They make you suspicious, paranoid." Because they copy the way a person behaves, talks, and moves - down to the smallest details and mannerisms - and it's almost impossible to tell if someone is infected, until it's too late. There are, of course, some tests that can be done (the trials), but they're painful and horrific, and they are not 100% accurate. Worst part? No one knows where they came from, what they want (other than the usual - to devour all human beings) and how to stop them. Bullets and knives don't work on them and the only thing that destroys them is fire. And to have fire, you need fuel, that is not at all easy to come by. In other words, Skaldi are almost entirely unstoppable. Querry is an interesting character. I really love unreliable narrators. They're unpredictable and they keep me on my toes all throughout. Querry is not the greatest unreliable character I've ever met, but he is definitely a good one. Between his memory loss and all the secrets everyone seems to be keeping from him, he is just as clueless as we, the readers, are, and it really helps create tension. There are some really great plot twists in this book, too. Some I anticipated, others took me by surprise, but overall all of them were well thought-out and satisfying, resulting in a really exciting and captivating story. The ending, while providing some closure, left many questions unanswered, hinting at a possible sequel. And I would really like to see Joshua David Bellin write a follow-up, for there are so many things about the world, its history and, most importantly, about Querry himself, that I would love to find out!